We found Casa Hogar Los Angelitos while wandering the busy streets of Manzanillo, Mexico. The home was first started by an american woman named, Nancy Nystrom, following the loss of her son, Fred. 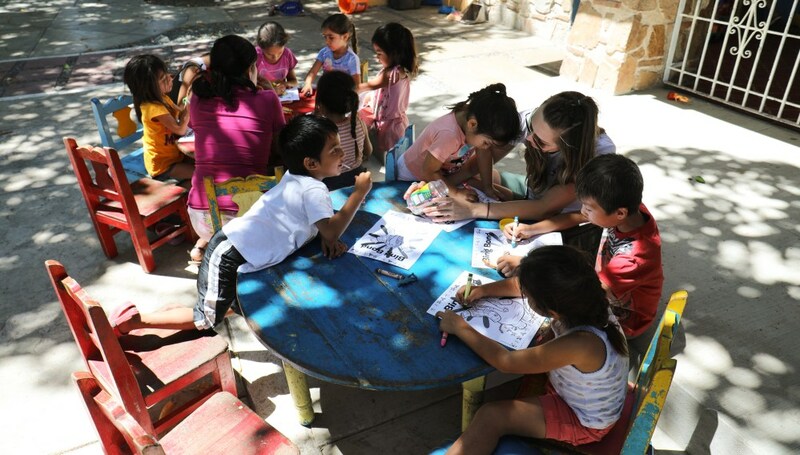 In 1994 she founded The Children's Foundation, a 501c3 corporation located in Colorado and in 1995 Nancy founded the Mexican Civil Association Casa Hogar Los Angelitos for the purpose of rescuing and changing the lives of children in extreme circumstances. The home is currently home to about 95 children and they are one of the few homes that allow the children who have reached the age of 18 to continue living on site and continue their studies or work until they can support themselves. It was a surprise visit and we found all the children well cared for and the facilities very clean. When we asked what their current needs were, they very simple: rice beans, meat, pasta, cooking oil, underwear for the smaller children, diapers, wet wipes, menstrual pads for the teenagers and hygiene supplies like handsanitizer and toothpaste. The only major need that we weren’t able to meet at the time was for well made, collapsable chairs. When we visited, the children were eating in shifts since there were not enough chairs for them all to sit together at once. Many of their old chairs had broken or were rusting out and not very safe for the children to use. More information from their website: "Casa Hogar Los Angelitos (CHLA) is a unique children’s home. Children from infancy and up find a safe place of healing to call home. Helping each child, regardless of previous circumstances, reach his or her full potential and dreams is the guiding principle. To break the cycle of poverty and positively change the life of each child is the ultimate goal. CHLA provides 24-hour care in a family-like setting, with emotional, mental and medical care, education, spiritual foundation, English and Expressive Arts classes. Education is a proven avenue to breaking the cycle of poverty. All school age children at CHLA attend school. Accommodations are made for those with learning disabilities and full-time tutors are provided for all children. Children are not sent back to the streets at a certain age but are encouraged to stay in school and to follow their dreams. After high school, students are encouraged to go to trade school or university. For many years CHLA has offered classes in the Expressive Arts. Dance, music, vocal, painting, arts & crafts are part of the daily life at CHLA. This has proven to be invaluable in helping the children to heal emotional traumas; stay focused in school and encourages self-confidence with cultural pride and understanding. The emphasis on the arts sets CHLA apart and helps to make it a unique and successful program. CHLA opened its doors in 1996 with 7 children in a storefront in Manzanillo Mexico. In 1995, before CHLA was officially open, a soup kitchen was started to help feed the children who were living on the street or in extreme poverty. The catalyst for intervening for the children of Mexico by founder Nancy Nystrom was the deep grief she experienced after the death of her son. Through that difficult journey she felt God’s call to make a difference in the world around her. CHLA is a Civil Association (non-profit) under Mexican law. It is not a religious or government organization. CHLA’s major funding comes from individuals, businesses, fundraising events, grants and service clubs. 'I realized during the early years of this work that providing nutrition for hungry children was life-saving and important. Empty stomachs need to be filled…. However, I knew that we needed to do more than rescue children and fill their stomachs. We needed to fill their hearts and their minds as well.'"